I founded Songwriters' Studio Services in 1984 with the concept of providing songwriters an affordable and creative studio to develop and record quality demos, jingles, and independent albums. Being a songwriter, and being involved with many other prolific writers, I felt there was a need in the community for local musicians to have a home base to hone their craft. Over the many years in existence, the studio has produced many recordings of new songs, audition tapes, karaoke tracks, radio spots, and independent album productions. Songwriters' Studio Services has also been an educational site for new engineers and producers to advance their recording skills. The studio is located in Northridge, CA., centrally located in the San Fernando Valley. It is a 900 square-foot facility utilizing a control room, lounge, amp room, vocal/acoustic booth, and a performance room for live drums. 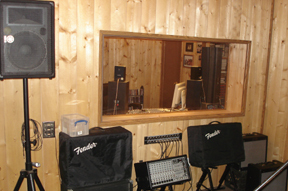 Private and personal, the comfortable rooms provide for quality sound and quiet recording. Vaulted 15-foot high ceilings allow for additional air space and ambience. A Mackie 8-buss mixer and the Steinberg Nuendo digital computer recording system drive the studio as well as an Alesis HD24 digital recorder for 24 bit unlimited tracking potential. Alesis, Yamaha, and DBX are some of the outboard gear available to you along with an assortment of quality AKG, Shure, and RODE microphones. A Roland keyboard along with guitar and bass amps are also part of the equipment furnished. Included with your sessions, I will produce, engineer, and contribute guitar, bass, and pedal steel guitar services at your request for no additional fees. Also available to you is a large selection of quality musicians for any style of music (additional fees and scheduling required). Songwriters' Studio Services can pre-master and/or master your final mixes in preparing your project for the final stages of production. We will work with you to ensure a positive experience with quality results, along with creating a personal and comfortable environment for you to enjoy your music. e-mail Robert Heft or call at 818-400-6294.